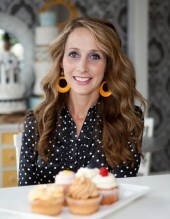 If you're a fan of cupcakes and of watching Food Network's Cupcake Wars, you may recognize Janell Brown. Janell's story is a foodie's dream come true. She began taking cake decorating classes as a way to express herself artistically. She then turned her stay-at-home mom craft into a successful business which was expanded when she won Cupcake Wars in 2012. 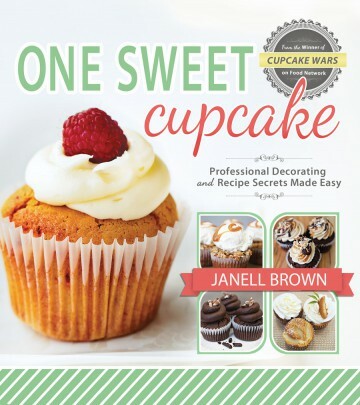 With the publication of One Sweet Cupcake, published by Cedar Fort, Janell is sharing her recipes with the world. The cookbook is full of classic recipes combined with a few surprises. All of the cupcake recipes are a little different from standard cake recipes as they call for sour cream, unsweetened applesauce, and vegetable oil with the non-chocolate also requiring buttermilk and only 1/4 cup of butter. I liked Janell's "use what you have" attitude when it comes to ingredients. She acknowledges that not everyone has unique ingredients readily available to them. There are also chapters on icings, toppings and fillings, and easy decorating ideas. I tested the classic Vanilla Bean cupcake with with Vanilla Buttercream as well as the Pistachio Cream Cupcake with Pistachio Buttercream. I am a purist when it comes to cupcakes so my favorite flavor is vanilla. This cupcake was moist and had a good texture. The cake was good by itself and my children ate several of them before they were frosted. 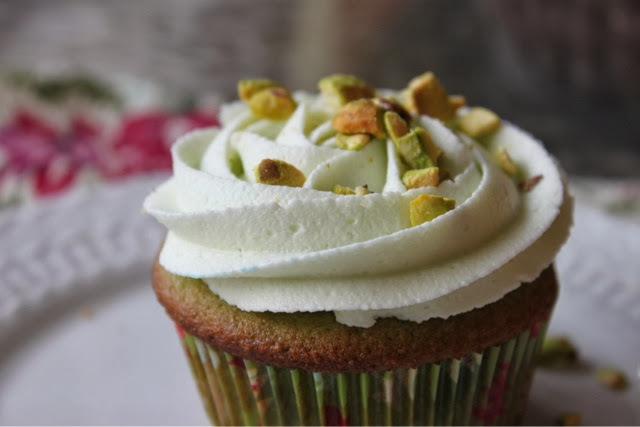 When I took the samples to work, my co-workers enjoyed the Pistachio Cream Cupcakes. They loved the combination of the salty nuts with sweet buttercream frosting. 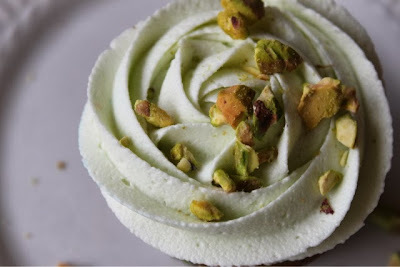 We considered these cupcakes for adults because the chopped pistachios added sophistication to the cupcake. Both the Vanilla Bean and Pistachio Cream cupcakes were a hit with everyone who sampled them. One Sweet Cupcake would make the perfect holiday gift for those bakers on your shopping list. With all of the recipes made from scratch, this cookbook will appeal to serious bakers. The recipes and instructions are straight-forward and easy to follow. The beginning baker will also benefit from this cookbook. I am happy to add it to my cookbook collection. Disclaimer: The publisher provided me with a copy of the cookbook for review; however, the opinion expressed here is my own.